Vancouver businessman Ripudaman Singh Malik and Kamloops sawmill worker Ajaib Singh Bagri have been acquitted on charges of conspiracy and mass murder in the 1985 Air India bombings that killed 331 people. Mr. Justice Ian Bruce Josephson of the B.C. Supreme Court says he does not believe the alleged confessions by Malik that were reported by the Crown's key witnesses. He says those witnesses were untruthful, inconsistent and came forward too late to be credible. The star witness in the criminal trial of Malik and Bagri was a woman who was in love with Malik and testified that he told her: "We had Air India crash." Fearing for her life, she is now in a witness protection program. The judge labelled the woman's testimony as not believable, given that she said she still loved and respected him while testifying against him. "That surprise edges toward incredulity," says Josephson. pointing out how strong and intelligent the unnamed woman appeared to be in court. "She has not been truthful with court, and I am unable to rely on her evidence." The defence had painted the witness as a woman scorned who was taking revenge against Malik. to the media in Vancouver on Wednesday. 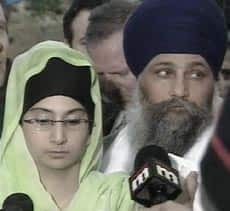 After the verdicts, Bagri 's daughter read her father's prepared statement to the media thanking his family and his legal team – and expressing relief at being free after four-and-a-half years in jail. "I have been accused of horrendous crimes. I had no involvement…I am innocent." "Yes, because I am innocent." Malik left the courthouse without comment, walking through a crowd of reporters and cameras and was driven away in a black Mercedes. His family later released a statement expressing sympathy for the families of the victims of the bombings, saying their anger at the verdicts is misdirected. "The anger and sadness that the families are going through because of today's decision should be directed towards the RCMP and the Crown. They had given these families a false hope of justice by proceeding with a case without merit." The acquittals stunned many leaders of B.C. 's Indo-Canadian community. "I think it also sends a message to terrorists: in Canada you can blow up an airplane, kill innocent human beings and nothing will happen to you," says Hayer, declaring himself "shocked" with the verdicts. "There are no answers for the relatives of the people who lost their lives, or for the Canadian people," says Sarwan Singh Randhawa of the Khalsa Diwan Society. "They don't know who did it...Who is behind this horrible crime?" And Randhawa said there should be a public inquiry on the investigation and prosecution. Malik and Bagri had been accused of causing Canada's biggest-ever mass murder by planting a bomb that destroyed Air India Flight 182 off the coast of Ireland on June 23, 1985. All 329 people aboard the jetliner died. And the two B.C. men were charged with 329 counts of first-degree murder. They were also accused of causing a separate explosion that killed two baggage handlers at Tokyo's Narita airport the same day, just an hour before the Air India crash. The baggage handlers died when a bomb went off inside a suitcase they were transferring to another Air India flight – Flight 301. Malik and Bagri were also charged with conspiring to murder the passengers on Flight 301. The Crown had alleged that they planted the two bombs in an act of vengeance against the Indian government in the wake of the 1984 raid on the Sikh faith's holiest shrine, the Golden Temple at Amritsar. The mastermind of the plot was thought to be Vancouver's Talwinder Singh Parmar. He died in a 1992 shootout with police in India. Another B.C. man, Inderjit Singh Reyat, has already served jail time in connection with the bombings. He pleaded guilty to 329 counts of manslaughter over the downing of Flight 182, drawing a five-year sentence, after being previously sentenced to 10 years on explosives and manslaughter charges over the deaths of the two Japanese baggage handlers. Malik and Bagri have been on trial since April 28, 2003. It cost more than $100 million – making it the longest, most expensive legal proceeding in Canadian history. Wednesday's verdict may not be the end of the process. There could be an appeal. The Crown says it will examine the judgement before deciding whether to appeal Josephson's decision. It has 30 days to do so. Some family members of the victims have renewed their calls for a public inquiry into how CSIS and the RCMP handled the investigation. They cite the delay in laying charges, as well as the fact that key tapes containing 150 hours of conversation with Sikh informants were destroyed because a former CSIS agent feared their identity would be revealed. Others were erased, possibly without ever being listened to, because the agency routinely destroys such tapes after a specific period of time. The fact that some conversations were taped three months before the day of the bombings led some relatives to wonder if the tragedy might have been prevented with better intelligence work. OPEN LINE: The Early Edition's Rick Cluff, CBC TV reporter Terry Milewski and Vancouver Sun reporter Kim Bolan take calls from listeners about the verdicts.